Some would include an additional category of box and pen traps, but the triggers for these traps are basically the same as the triggers for deadfall traps. The figure 4 trigger gets its name from the fact that it looks like the numeral 4 when it is set. It can be used as a trigger for deadfall or box traps. It can be baited or set as a contact trigger (a contact trigger is a trigger that is set without bait and relies on the animal brushing against the trigger to spring the trap). The figure four trigger is made from three sticks that can vary in size according to the size animal that you are hoping to catch. Before collecting the materials for your figure four trigger, it is a good idea to de-scent your hands as much as possible. The entire trigger will be de-scented before it is set, but de-scenting your hands is a good additional precaution to take. Hands can be de-scented by rubbing them with aromatic plants such as juniper or sage. This will help mask the human smell. Also, do not gather trap building materials in the vicinity where you are planning on setting the trap. The trap location needs to remain as undisturbed as possible. No matter what size trigger you are building, it is important to select your materials carefully. Dead, but solid sticks are the best. Rotten sticks will not support the weight of a deadfall, and green sticks may bend and bind the contact points of the trigger. Shape the components of your trigger carefully, making sure that all contact points are clean and smooth. Make sure that all of the contact points on your trigger fit cleanly and that they release quickly with a minimum of pressure. It is not as easy as you might think to make a trigger that will support the weight of a heavy deadfall, but will let that same weight come crashing down with only minimal pressure on the trigger. Make sure that the diagonal stick (the one that actually supports the deadfall) extends well beyond the upright post. If the diagonal stick is too short, the deadfall may hit the top of the upright stick. This can slow or even stop the descent of the deadfall, and mean a lost animal. After you have shaped all of the trigger components do not remove the bark from your sticks, and be sure to go back and rub mud or dirt on the white wood that has been exposed by your carving. This white wood, if left untreated, will be like a neon warning sign to any animal that approaches the trap. The upright and diagonal sticks of you trigger will remain the same no matter what kind of trap you are setting. The horizontal stick will vary according to whether you are setting a baited trigger or a contact triggeu take your completed trap to the selected trapping location, you need to de-scent all of the trap components. The best way to do this is to smoke the components over a smudge fire. The smell of burned wood is generally not an alarm signal to animals, and it is a very effective covering for any human smell that may remain on your trap components. The Paiute trigger is extremely fast, and it is fairly simple to build. Its only draw back is that building it requires a short piece of fairly strong cordage. If you do not have any cordage with you, you can twist some up out of yucca leaf fibers or other natural materials. The Paiute trigger resembles the figure four trigger in that the diagonal member of the trigger supports the deadfall. An upright stick supports the diagonal, just as in the figure four triggers. The difference is in the horizontal member. 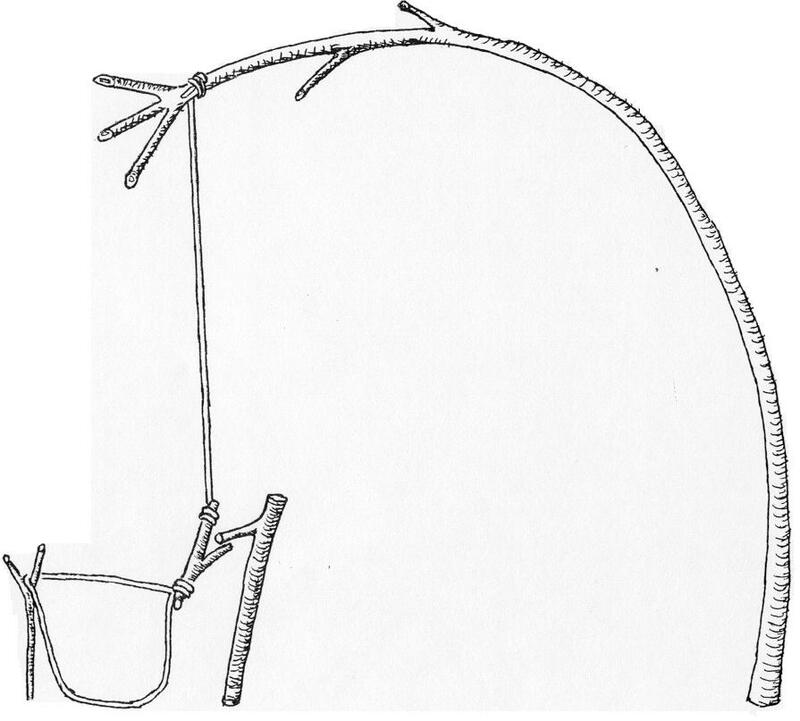 Instead of a solid stick, the Paiute trigger uses a piece of cordage tied to the bottom of the diagonal. 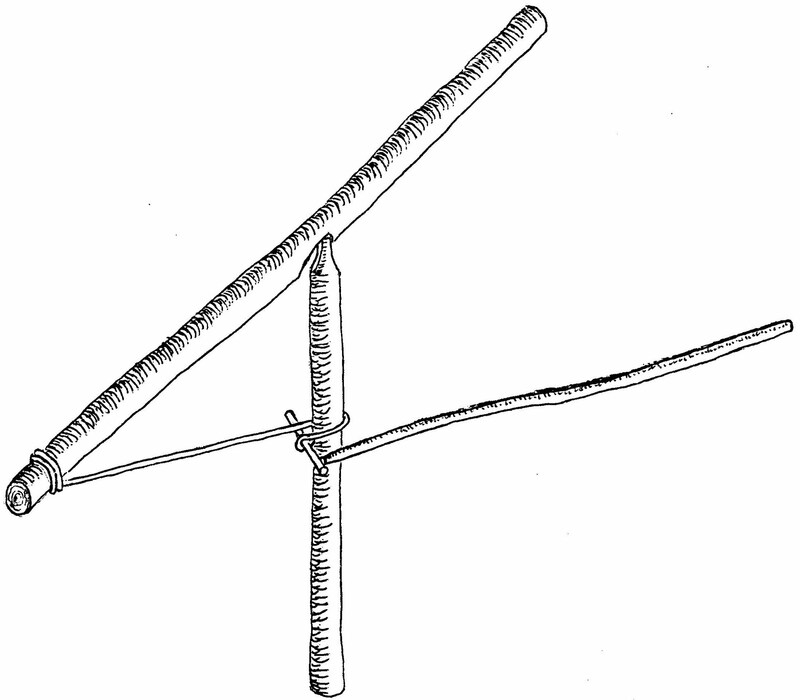 The cordage, which has a small cross stick tied to the other end, is then wrapped once around the upright stick, and braced in place with a bait stick. The Paiute trigger is best for small game like squirrels and other rodents. It can be used for game up to the size of possums and raccoons, but be careful making a trap of this size. 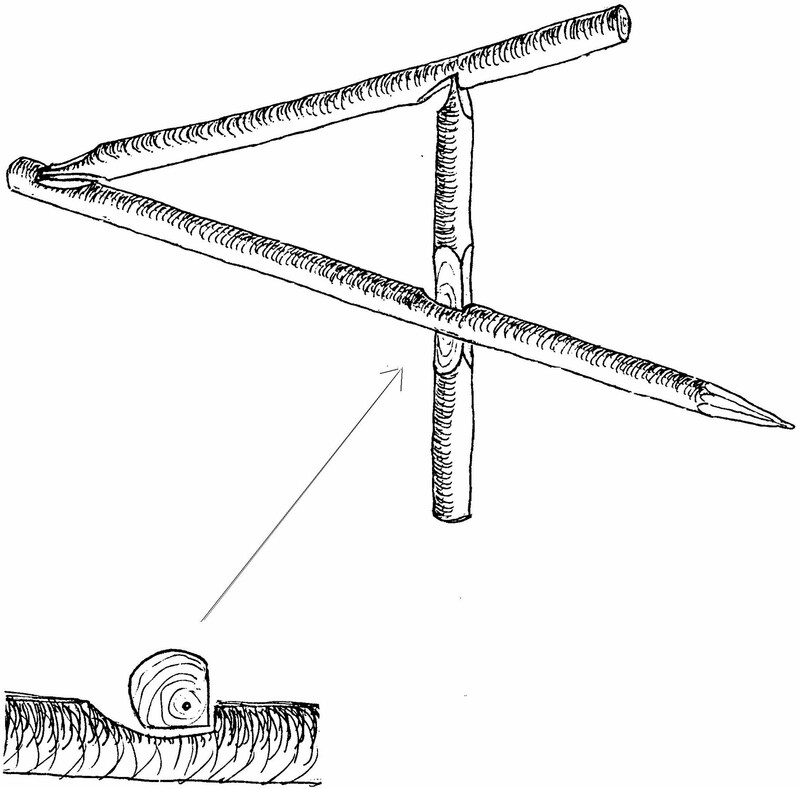 A large deadfall will put too much pressure on the small bait stick, and the trap may spring on its own. The Paiute trigger will work most effectively as a baited trigger. It is not well suited as a contact trigger. The rolling snare is one of the easiest and most effective trap sets that you can make. The rolling snare requires several feet of good cordage that can be made from native plants if you do not have any string with you. The way that the rolling snare works is fairly simple. A noose of cordage is attached to a bent sapling. The sapling is held down by a rolling snare trigger. When the target animal walks into the snare, it springs the trap. The sapling snaps back up to its original upright position, and the noose closes around the animal. As with other types of traps, the key to a good rolling snare is a good trigger. The rolling snare trigger consists of two sticks with a branch projecting from each stick. One stick is driven firmly into the ground with the attached branch angling down. This is the hold-down stick, and it must be in the ground firmly enough to prevent the stress of the bent sapling from pulling it out. The other stick is called the trigger stick. It has the noose attached to one end of it and the line to the bent sapling attached to the other end. The projecting branch of the trigger stick is locked under the projecting branch of the hold-down stick. This keeps the sapling bent down until the noose is disturbed. The key to a good rolling snare trigger is to make sure that both of the sticks in the trigger will stay firmly locked together, so that accidental tripping of the snare is avoided, but to have the sticks locked together so lightly that the least disturbance of the noose will spring the trap. This is a delicate balance to arrive at, and can only be achieved with practice. Be very selective about the sapling that you select for your spring-pole (the bent sapling that springs up when the trap is triggered). It should be flexible enough to bend, but resilient enough to spring back to its original position. A sapling that bends easily but will not spring back, does not make a good spring-pole. Also, check the rolling snare often to determine if the spring pole still has enough snap to operate the trap. After a sapling has been held in a bent over position for several days it tends to retain that shape and loose its spring. If this happens you will need to disassemble the trap and move your trigger to a new location. All of the same rules regarding de-scenting and camouflage of exposed wood apply to the rolling snare trigger just as they apply to other types of triggers. The best time to practice any wilderness survival skill is when your life doesn’t depend on it, so I would encourage you to practice building deadfalls and snares now. Build and set them many times so that the methods become familiar to you. One word of caution, snaring animals with improvised traps is illegal in many states, so be sure and check your local game laws before you actually leave a trap set in a way that might catch an animal. Any tips on how to catch a squirrel thats hiding in your attic? It's your science student, Michael Frake. Just wanted to say that these are cool posts, and I've read every one of them. The springiness of saplings can be useful for other things too. The Foxfire Book vol 1 has a spring lathe made of a sapling, a strip of cowhide and not much else. Also, check out whip bows, and spring shot guns.